Explore Key West on this Miami to Key West Tour. You'll have 6 hours free time to explore the island. Experience the best of Florida with a day trip from Miami to Key West. The relaxing Caribbean atmosphere will dissolve your cares as you leisurely discover the southernmost city in the Florida Keys. 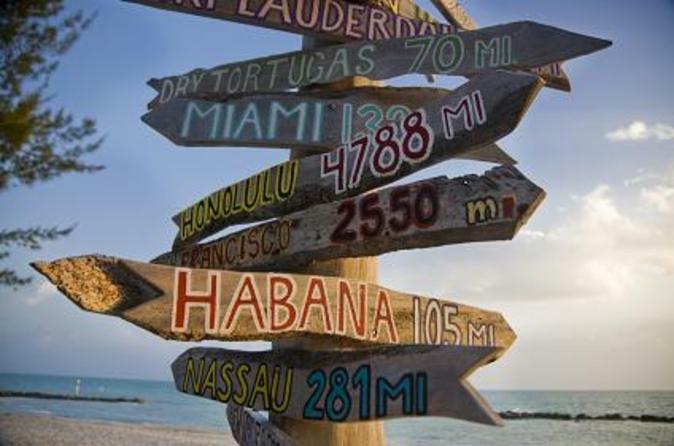 Miami to Key West Tours. Enjoy the 6 hours of free time in the island when you arrive in Key West. Definitely one of the most exciting trips you can experience in South Florida. First you stop to have breakfast (not included in tour-price) before enjoying a scenic drive across 42 bridges and 32 islands to Key West. Here the Caribbean atmosphere, street artists, outdoor cafes and restaurants are just waiting to enchant you. After you arrive, you will have plenty of time to explore Key West on your own. You could visit the southern-most point in the continental US, Hemingway's house and Mallory Square - located by the historic Key West waterfront. This open-air marketplace and entertainment complex is a great place to start or end your visit to Key West. Departure from Key West is at approximately 4:00pm.